With nearly 83% of sales teams making use of a CRM like Salesforce, sales managers may feel complacent in letting the software do all the legwork. While it’s true that the software keeps customer information organized and tracks sales opportunities, there is always room for improvement. For example, by integrating CPQ with your CRM, your sales team can become even more efficient and powerful, leading to even more and better sales opportunities. 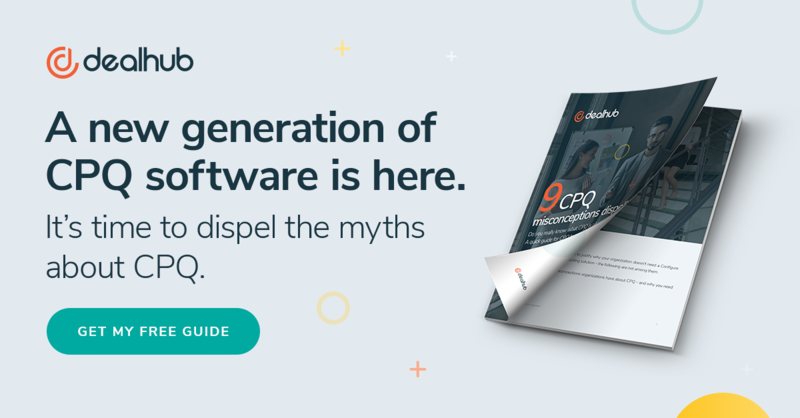 Here are some of the ways CPQ complements CRM and why you should be making the integration sooner rather than later if you want your sales force to lead the charge into 2019. It’s astounding how many sales teams use optimal CRM solutions to assess leads and follow up with them, but then use stand-alone tools for things like sales quoting, price optimization, content management, playbooks and the like. Instead of having to use Microsoft Excel and Word for these sales solutions, a CPQ can turn them into a seamless part of the sales process. If you’re using CRM, you already understand the value of automated data processing, tracking and action procedures. Why stop half-way through the sales process? CPQ essentially does the exact same thing as CRM, just for different elements within the sales cycle. It’s not difficult to see how CPQ complements CRM. Imagine your reps being able to communicate with and send a proposal to a prospect in record time. With all of these processes being connected, the customer feels more confident that the rep is prepared and organized. As such, the sales cycle never becomes bottlenecked; meaning more chances at a successful deal. Studies show that companies that use CPQ solutions enjoy faster sales cycles. Reps are able to generate complex quotes promptly, they are able to respond rapidly to proposal requests and avoid “indecision” sales losses. When combined with the power of efficient CRM solutions, a rep’s job becomes easier with a streamlined and optimized workflow. When reps are using top CRM solutions like Salesforce along with other stand-alone tools, the chance of errors occurring increases exponentially. Not only that but reps tend to waste too much time searching for materials when they’re not already part of the workflow. When CPQ is integrated with CRM solutions, everything meshes. It’s all part of the same workflow, reducing errors and allowing the rep to pull proposals, quotes and other materials from their hat like a practiced stage magician. This impresses prospects, wows customers and makes it more likely that reps will get an emphatic “yes” when it comes time to close the deal. This is the biggest point sales managers need to realize when it comes to marrying CPQ and CRM. If your reps are already using a CRM, trying to force other smart sales solutions upon them will only confuse matters. Worse still, some reps may resist the new software out of spite. Why learn how to work something else when the CRM seems to work just fine? tends to be the reasoning behind such resistance. On the other hand, CPQ integration with the CRM platform your reps already use requires little to no learning curve. The CPQ becomes part of the sales process itself. When reps realize how much easier their jobs have become, adoption is automatic, even heralded, and revenue generation immediately becomes greatly impacted. What’s not to love about that? The bottom line is that CPQ complements CRM. They go together like chocolate and peanut butter. One is great without the other but put the two together and the mixture becomes instantly irresistible. Your sales force will think so too. So the question is, why haven’t you made the integration yet? Put these automated sales solutions together and you’ll soon see that a more efficient and powerful sales team awaits. Updated September 14, 2018. Original publication date December 23, 2015. As Chief Revenue Officer, Eyal is extremely passionate about helping companies gain a more informed and actionable understanding of the changing landscape within CPQ and Sales Engagement. He is a regular content contributor in this area of expertise and draws inspiration from being afoot to the latest trends and statistics influencing CPQ and Sales Engagement.